The Battle of Chickamauga, Georgia was September 19 - 20, 1863. Union and Confederate forces fought for control of Chattanooga. It ended the Union offensive in south-central Tennessee and northwestern Georgia. It was the last significant Confederate victory.Espy Dill, Ann Taylor Dill's husband, William C. Baker, Rudolph Baker's grandson was taken prisoner by the south. Josiah Smith was taken prisoner by the north. Josiah Smith, Sr. was born August 8, 1825 in Piney Flats, Sullivan County, Tennessee. His parents were John Smith and Catharine Humphreys. He was called Si. His 1864 Oath of Allegiance indicated that he had a light complexion, light hair, blue eyes and was five foot seven inches tall. Census information indicated that he could read and write. He married Sarah Pitts on October 15, 1846 at Blountville, Sullivan County, Tennessee when he was 21. Their children and life together are described in detail in the section on Josiah and Sarah Smith. George R. McClellan was in command of a company from Sullivan County, which was taken in flat-boats to Memphis, whence they were transported to New Orleans and across the gulf of Mexico. The eagerness of Tennesseans to enlist for this war was so notable that the Secretary of War sent the following message to Gov. Brown: "We do not intend that Tennessee shall fight this war alone." Josiah served as a private with the Sullivan County unit under Captain John S. Shaver in Company C of the 5th Regiment of the Tennessee Volunteers. They were commanded by George R. McClellan. He was honorably discharged on July 20, 1848 at Memphis, Tennessee. He participated in several skirmishes and obtained a land warrant for his service which he later sold. At the time of the 1850 census he was 25 years old and he was a farmer. I recall hearing my grandmother [Nancy Ann Smith Wilson] talk about her father being drafted into the Confederate army. She said his sympathy was with the North. Josiah Smith was in the Confederate Army and deserted and went to the side of the North, my mother [Sarah Catherine Smith Hoops] told me that. Military records indicate that Josiah Smith enlisted for twelve months when he was 38 in the Confederate 5th Cavalry in Decatur, Tennessee on November 1, 1861. His horse was valued at $160 and he received $48 pay for November and $24.40 in the following months. He served under Captain George W. McKenzie in Company B and C of the Tennessee Cavalry. Company B was reorganized on November 1, 1861 and became Company C, 5th Regiment. They were ordered to the Kentucky border to meet the Union army as it retreated from the Battle of Fishing Creek. They were kept on duty in East Tennessee and the border counties of Kentucky until July 25, 1863. They were again ordered to Kentucky and participated in the fight at Richmond, Kentucky on July 27. Then they moved to Paris, Kentucky, the following evening and were repulsed and cut off from the brigade and did not catch up with the brigade until they were back in Tennessee. East Tennessee was evacuated on August 20 and they brought up the rear of General Buckner's Army and met the enemy at Loudon. They held them in check until the bridge was burned. They fought the enemy at Ringgold, Georgia, on September 11, 1863 and were in several skirmishes before the Chickamauga Battle. They participated in that battle on the 19th and 20th of September. On the 24th they were ordered to East Tennessee and drove the enemy back as far as Philadelphia. They were ordered to Cottonport and crossed the Tennessee River on October 1 and participated in the fight at McMinnville. They were involved in a severe fight in Shelbyville on the 7th October. They again crossed the Tennessee River at Courtland on 11 October, and moved up to Dalton, and back to East Tennessee and participated in the fight at Philadelphia and then back to Dalton, and were engaged with the enemy at the time of their advance on Dalton February 25, 1864 and then camped near Tunnel Hill, Georgia. During this time, the regiment was in John B. Palmer's Brigade at Big Creek Gap on February 20, and March 19, 1863. On April 25, they were in Colonel J. S. Scott's Brigade, which was on outpost and special duty. At Chickamauga, Scott's Brigade was in Brigadier General John Pegram's Division. The 5th reported 16 casualties in the attack on Philadelphia. On December 31, the regiment was in Brigadier General H. B. Davidson's Brigade. By June 30, Colonel Henry M. Ashby had been given command of the brigade, and it was known from this time on as Ashby's Brigade. In the fighting around La Grange and Newnan, Georgia in late July, 1864, Ashby's Brigade was engaged, and Colonel McKenzie's regiment was sent "to gain the front of the enemy moving toward Franklin," and McKenzie captured 200 or 300 prisoners. On August 30, 1864, Josiah appeared on the register of prisoners of war at Knoxville, Tennessee. He took an oath on the 31st and was sent to Chattanooga, Tennessee on September 13, 1864. He was captured a few weeks later on September 25th at Meigs County, Tennessee. This time he took an oath on September 26, not to return south of the Ohio River and was released. Prisoners who took the oath were classified by the North as Rebel Deserters and he appeared on a roll of deserters from the rebel army. Grand Dad [was] in charge of 50 men at Lee's surrender. Union chiefs told [them] if they would take the Oath to never bear arms against the Union they would turn them loose which they did after [they were] shipped via box car to Chicago [and] turned loose ?? one man [was] in a litter. They started West [and] were overtaken by southern simpathizers (sic) who took [the] sick man into [a] buggy [and he] gave grand dad $50.00 and told him if you can get these men to my ranch at Peoria, I will winter every dam (sic) one of you which he did. Come spring most of them went west to Iowa. Lots settled in Lucas County, Iowa. Another story from Velma Hoopes Keagle was that one day Josiah took his dog to church and when the preacher asked him to take it out he said, "if the church isn't good enough for my dog, it isn't good enough for me either" and he left. His grandson, Clell Downard said that when he was working on a threshing crew and a worker made an insulting remark about women. Si, being a chivalrous southerner took offense and whipped them all. Bryan Smith said he and was in Corydon, Iowa the day the James gang robbed the bank. In the 1880 census Josiah was listed as age 54 and a laborer. He died at age 55 on September 16, 1880 in Derby, Lucas County, Iowa of typhomalarial fever and was buried at Salem Cemetery in Lucas county south of Chariton next to his wife, Sarah. Typho-malarial fever was a camp fever during the Civil War. Children of Josiah Smith, Sr. The Mexican–American War was an armed conflict between the United States and Mexico from 1846 to 1848 after the US annexed Texas. Mexico claimed ownership of Texas and did not recognize the successful secession. Josiah Smith m. a Pitts and went to Meigs County, Tenn., and later to Iowa where he died. One of his childen Betty Jane, used to write back to her kinsfolk. 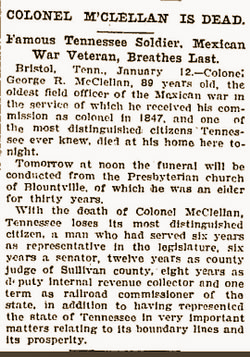 Josiah Smith was in Colonel George McClelland's Company in the Mexican War.